Start the Longbow Converter tool, select the 2nd tab, pick the c:\Autodesk\lddt2000 folder, and click Run. Read and understand all the prompts before pressing OK. Ignore the fact the the shortcut cannot be created, you will need to create this by hand once the installation is finished. Exit the setup when finished. Now run the land201.exe as normal from Windows Explorer. If you are getting an “Out of memory error” when you start a new drawing, try creating a new project, and use a previous drawing to ‘Save As’ a template for use instead. Installing AutoCAD 2000 Express Tools Volume 9 (et1-9.exe) on Windows 7, Windows 8, Windows 8.1 and Windows 10 32bit or 64bit can be very easily defined in these short steps. Start the Longbow Converter tool, select the 2nd tab, pick the newly created c:\Autodesk\Express Tools 2000 Volume 9 folder, and click Run. 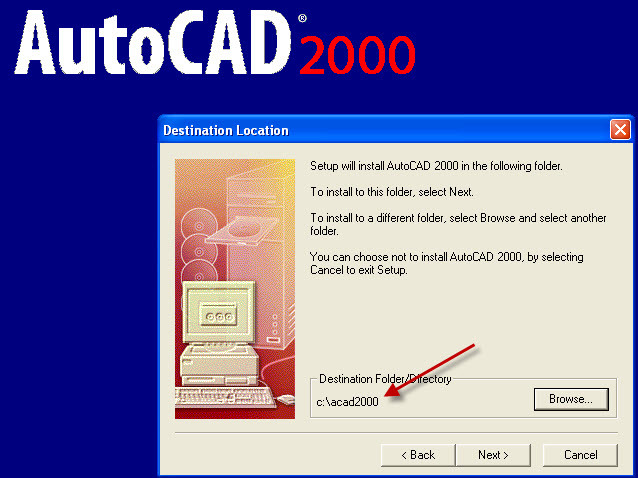 Read and understand all the prompts before pressing OK.
For AutoCAD 2000, the Migration Wizard almost instantly pops up, simply click Install 2000 as normal. Now, I know it’s unheard of these days, but at this point expect to wait at least 45 minutes for your AutoCAD 2000 setup.exe program to fully appear. In the setup program, navigate through each setup dialog as normal, except when you get to the installation folder, **it’s vitally important to make sure you install to c:\acad2000 (not Program Files (x86)\AutoCAD 2000 as usually prompted)** e.g. Ignore the error message that the shortcut cannot be created “Cannot create folder AutoCAD 2000“, you will need to create the program shortcut by hand once the installation is finished. Once installed, go back to the Converter tool, select the 3rd tab, pick the newly installed c:\acad2000 folder and click ‘Fix‘. Now you can happily run your AutoCAD 2000 in Windows 7, Windows 8 and Windows 10! Simply use Windows Explorer, navigate to c:\acad2000 and double click acad.exe. NOTE: Some users have found that the 3D Graphics System Update runs through the install as normal but doesn’t actually update the modules. If you suspect this is true, contact Longbow Software Support. If you see Proxy Warning Dialogs when you open a DWG using AutoCAD 2000, you need to install the service packs as described above. If you are receiving either an “Out of memory” or “Memory allocation error” while trying to plot inside of AutoCAD 2000, then you are most likely missing the AutoCAD 2000 patch called “plotupdate”. Next, read and understand all the prompts before pressing OK… Now, I know it’s unheard of these days, but at this point expect to wait at least 45 minutes for the AutoCAD 2000 Plotupdate setup.exe program to appear. Once the setup starts, install as normal (simply accept all defaults). PlotUpdate.exe – Fixes AutoCAD 2000 Heap error issues with system printers on Windows. PacknGo.arx – The initial AutoCAD 2000 version of the Pack&Go feature (PACK command) used system DLLs that may not be available on all systems. This fixes that issue. pnpltpc2– contains 3 PC2 files (16penplotter.pc2, 7475a6pens.pc2 and 7586-8pens.pc2) that have been generated in AutoCAD R14 to accommodate the pen wrapping effect for pen plotters. SwapContextMenu.arx – Allows AutoCAD 2000 user to swap default/edit/command mode context menus.